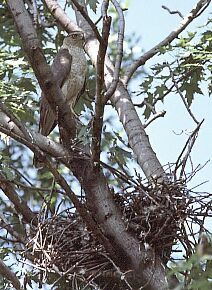 Cooper's Hawk was a very rare breeding bird twenty years ago but now is the most common nesting hawk in Windsor. 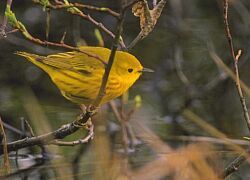 The breeding bird atlas is a project to document the distribution and abundance of breeding birds in Ontario over the five year period, 2001 to 2005. The first atlas project took place from 1981 to 1985. Over 1300 volunteers logged in excess of 180,000 hours of field work to collect the 400,000 records used to create the atlas. What changes have occurred over the past twenty years in Essex County? Has loss of habitat, urbanization and changes in land use resulted in changes in breeding bird populations? Casual observation has noted an increase in Canada Geese, Bald Eagles, Cooper's Hawks, Red-bellied Woodpeckers, Eastern Bluebirds, and Tufted Titmice. Other species such as Ring-necked Pheasant and Red-headed Woodpecker appear to be in decline. Although the Windsor - Essex area is perhaps best known for its distinctive absence of woodland birds such as Red-shouldered Hawk, Ruffed Grouse, Barred Owl and Pileated Woodpecker, there are several other interesting species of breeding birds to be found here: Least Bittern, Black-crowned Night-heron, Great Egret, Bald Eagle, Eastern Screech-owl, Forster's Tern, Yellow-billed Cuckoo, Carolina Wren, Tufted Titmouse and Yellow-breasted Chat are all regular nesting species. Each atlas square is a 10 by 10 km. block which covers 100 square km. Volunteers will spend about twenty hours in each square over the five year period 2001 to 2005 and record the variety and abundance of breeding birds. About 65 to 85 species can be expected per square. During the last atlas a total of 146 species were recorded in the Essex region. 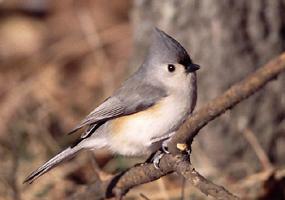 Birds are indicators of the overall health of our environment. Atlas data over time in any given area can provide valuable insight into the long-term health of bird populations. Volunteer to atlas a square, help organize square bashing, or prowl for owls, woodcock and other nocturnal species. Visit the Atlas web site and register on-line. Paul Pratt and Karen Cedar are the regional coordinators for the atlas project in Essex County. They will be organizing activities to help atlassers get started with their squares. Instruction Manual and forms for the Standardized Owl Survey. CDs and tapes for the Standardized Owl Survey. The Bluebird CD-ROM which has vocalizations of Ontario's breeding birds. Copyright © 2001-2002. All rights reserved. You are on a City of Windsor Web Site.